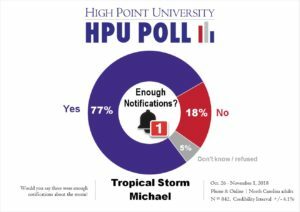 HIGH POINT, N.C., Nov. 13, 2018 – The most recent HPU Poll finds that more than two in five (41 percent) of North Carolinians say their families were directly affected by Tropical Storm Michael last month. This is compared to 38 percent that told us in our late September poll that their families were directly affected by Hurricane Florence. A little more than three-quarters of poll respondents (77 percent) said that there were enough notifications about Tropical Storm Michael. Almost everyone surveyed (95 percent) in the late September poll said there were enough notifications about Hurricane Florence. Majorities of North Carolina residents (55 percent) say that they were extremely well prepared or very well prepared for Tropical Storm Michael. Only half of those surveyed (50 percent) felt that the state was extremely well prepared or very well prepared for the storm, compared to 63 percent from our late September poll that felt the state itself was extremely well or very well prepared for Hurricane Florence. And many North Carolina residents took it upon themselves to stock up on a number of items. Poll respondents say they made sure to buy water (68 percent), extra gas (61 percent), bread (56 percent), milk (48 percent), and toilet paper (48 percent). Fewer people surveyed say they stocked up on plywood or other materials to protect their homes (14 percent), beer or other alcoholic beverages (15 percent), fruit (33 percent), eggs (36 percent), or flashlights (45 percent). We asked which storm, Michael or Florence, caused the most damage to their life and property. One-quarter (24 percent) said Michael, one-third (34 percent) said Florence, only 10 percent said both about the same, and 30 percent said that neither storm affected them. Now I am going to ask you some questions about the recent Hurricane and Tropical Storm, Florence and Michael, that hit North Carolina. Were you or members of your family directly affected by Tropical Storm Michael? How well prepared did you feel you were for Tropical Storm Michael? Would you say extremely well prepared, very well prepared, somewhat well-prepared, not very well prepared, or not at all well prepared? Thinking about both storms, Michael and Florence, which one caused the most damage to your life and property? Would you say there were enough notifications about Tropical Storm Michael? How well do think the state was prepared for the Tropical Storm Michael? Would you say extremely well, very well, moderately well, slightly well, or not well prepared at all? Which of these items, if any, did you make sure to buy before Tropical Storm Michael hit North Carolina? 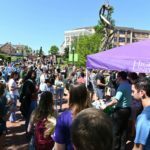 The most recent HPU Poll was fielded by live interviewers at the High Point University Survey Research Center calling on Oct. 26-Nov. 1, 2018 and an online survey fielded at the same time. The responses from a sample of all North Carolina counties came from a total of 842 adults who were either interviewed online (285 respondents) and landline or cellular telephones (557 respondents). The Survey Research Center contracted with Survey Sampling International to acquire these samples, and fielded the online survey using its Qualtrics platform. This is a combined sample of live phone interviews and online interviews. The online sampling is from a panel of respondents, so their participation does not adhere to usual assumptions associated with random selection. Therefore, it is not appropriate to assign a classical margin of sampling error for the results. In this case, the SRC provides a credibility interval of plus or minus 4.1 percentage points to account for a traditional 95 percent confidence interval for the estimates (plus or minus 3.4 percentage points) and a design effect of 1.2 (based on the weighting). 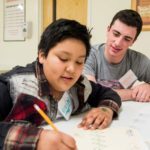 The data is weighted toward population estimates for age, gender, race and education level based on U.S. Census numbers for North Carolina. Factors such as question wording and other methodological choices in conducting survey research can introduce additional error into the findings of opinion polls. 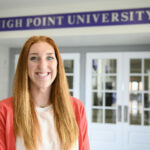 Details from this survey are available at http://www.highpoint.edu/src/files/2018/11/62memoA.pdf.